For centuries, the Chinese have carried their woks to all corners of the earth and re-created stir-fry dishes, using local and sometimes nontraditional ingredients. The old expression "One wok runs to the sky’s edge" means "one who uses the wok becomes master of the cooking world." And as the wok user becomes master of the cooking world, so does he become master of the stir-fry, one of the greatest techniques of Chinese cookery. The technique and tradition of stir-frying, which is at once simple yet subtly complex, is as vital today as it has been for hundreds of years. In Stir-Frying to the Sky’s Edge, award-winning author Grace Young shares more than 100 classic stir-fry recipes that sizzle with heat and pop with flavor, from the great Cantonese stir-fry masterpieces to the culinary customs of Sichuan, Hunan, Shanghai, Beijing, Fujian, Hong Kong, Macau, Taiwan, Singapore, and Malaysia, as well as other countries around the world. With more than 80 stunning full-color photographs, Young’s definitive work illustrates the innumerable, easy-to-learn possibilities the technique offers — dry stir-fries, moist stir-fries, clear stir-fries, velvet stir-fries — and weaves the insights of Chinese cooking philosophy into the preparation of such beloved dishes as Kung Pao Chicken, Stir-Fried Beef and Broccoli, Chicken Lo Mein with Ginger Mushrooms, and Dry-Fried Sichuan Beans. In honoring the traditions of her cultural ancestors who traveled the globe, Young also offers delectable crossover recipes for Chinese Jamaican Jerk Chicken Fried Rice, Chinese Trinidadian Stir-Fried Shrimp with Rum, Chinese Burmese Chili Chicken, and Chinese American Shrimp with Lobster Sauce. Expert home cooks and professional chefs teach you the foundations of stir-fry mastery in the modern kitchen, from how to choose, season, and care for a wok and the best skillet alternative; the importance of marinades and the proper technique for slicing meat and poultry for optimum tenderness; how to select and handle Asian vegetables; ways to shorten labor-intensive preparations; and tips on how to control heat and choose the best cooking oil. Fascinating personal portraits illustrate how stir-frying is not just a cooking technique but a vital element of China’s rich culture. 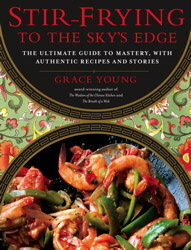 With this book, Grace Young has created the authoritative guide to stir-frying, a work that is at once rewarding and beautiful, much like the technique of stir-frying itself.